The House That Stamps Built. She's chosen to have us all 'Ring in the New Year'! I decided to go clean and simple with today's card. Anyway, this was easy peasy, and this stamp can be used for SO many occasions! Hope you will do a bit of shopping at Repeat Impressions - see my sidebar to find out how to save some money on each order! Now, it's time to hop along to see what my fellow Rock Stars have created to 'Ring in the New Year'! at The House that Stamps Built! I hope that you and your family are enjoying this wonderful day! It's my day to post for Die-Versions, and what better way to end the year, than by showcasing my favorite DV die! 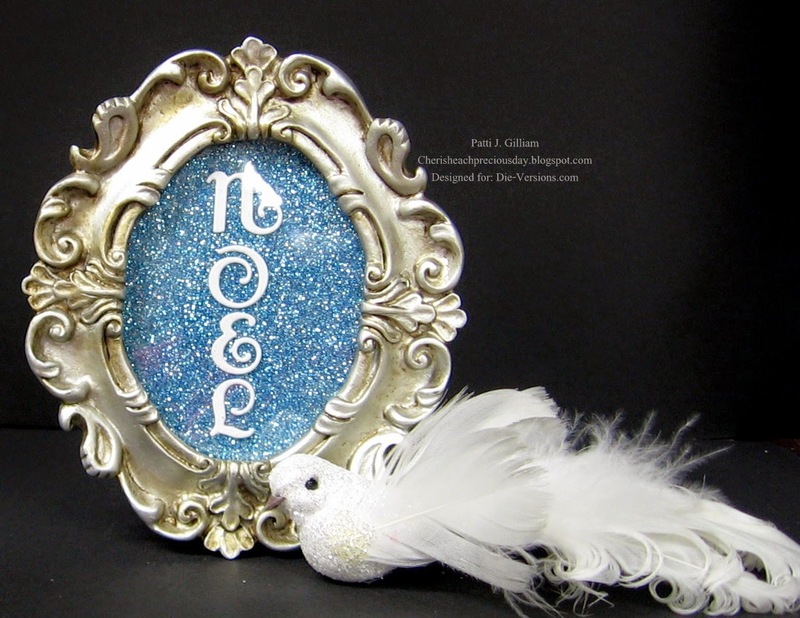 I found that I used the "Crochet Lace" die #DVW-322 for so many things this year. It's so versatile, and cuts like butter! Hope you've enjoyed this look back! Be sure that Santa knows you'd like some Die-Version dies, and while you are out and about, check out the DV blog! There is daily inspiration to be found there - hope you'll sign up to follow us! Hope you are ready for Christmas. We are more than ready this year. any gifts at all - what fun! Wendy, the Repeat Impressions owner, sent us another amazing sketch to work with. 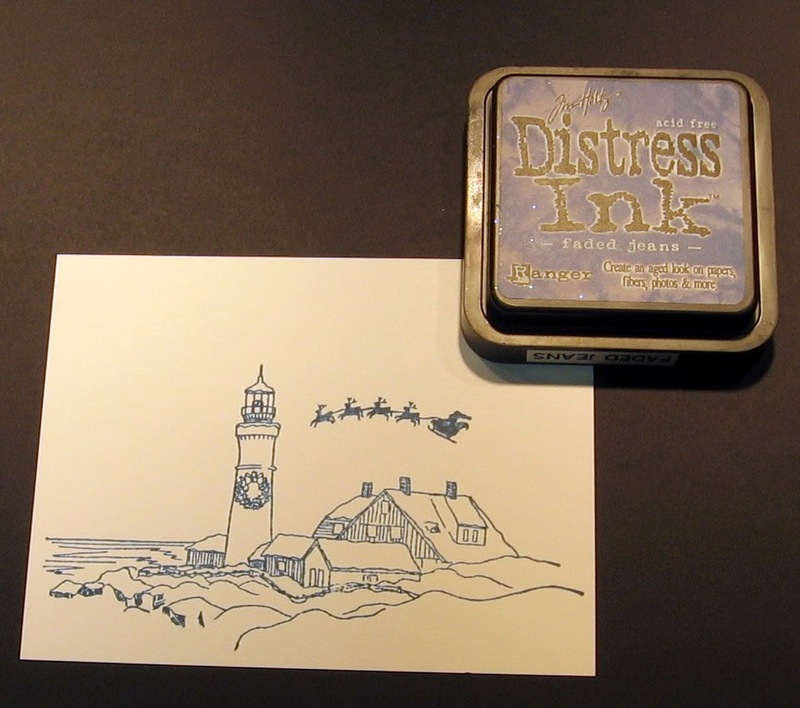 Her sketches make creating with her wonderful stamps SO easy! I just hope that Santa has paid attention! Now it's time to see what my fellow Rock Stars have created with this sketch! 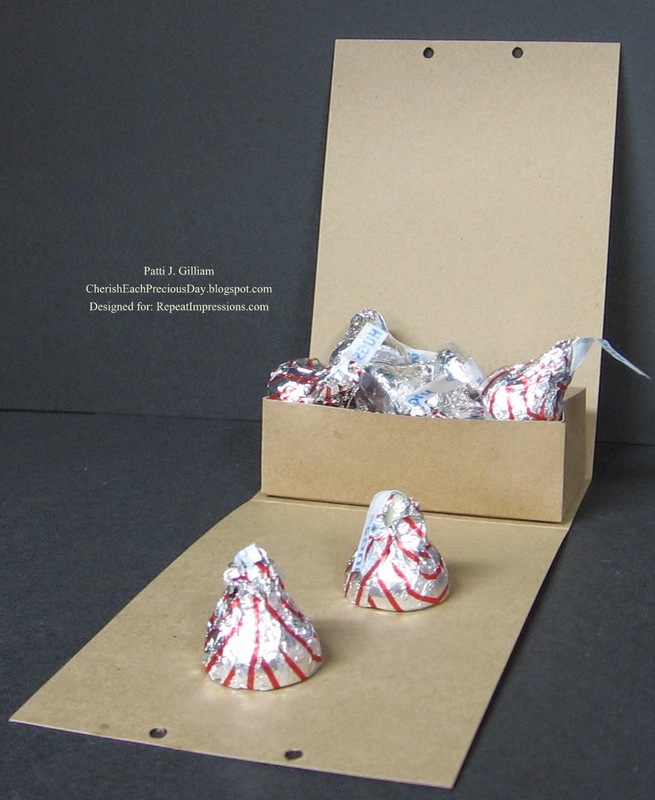 Stop by the Repeat Impressions blog, The House that Stamps Built, and check out the challenges. We have a Project of the Week each Monday, too! LOADS of inspiration there! Be sure to do a bit of shopping (Santa needs help, you know?) at the Repeat Impressions website! 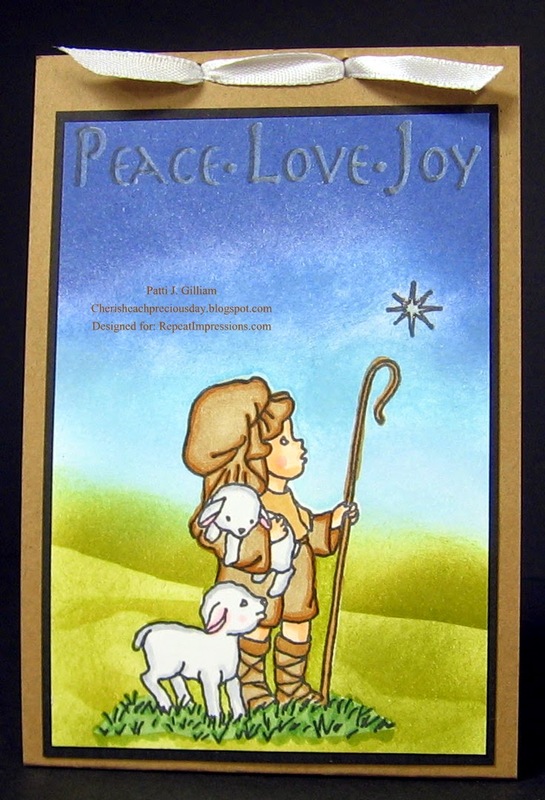 Hope your Christmas is filled with all the blessings of this glorious season! 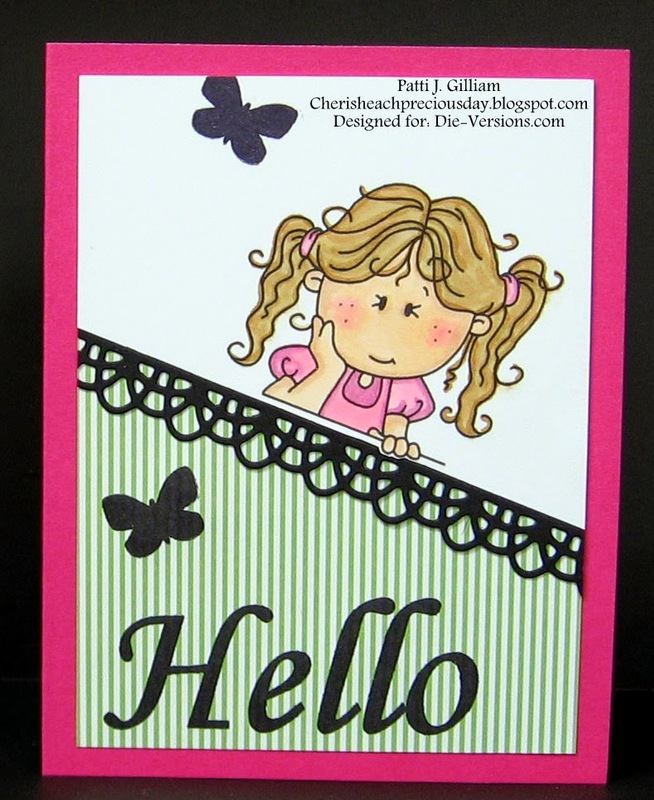 *Used my Perfect Papercrafting Perfect Layers Mini Rulers and Cutting Mat for the green mat - check out my sidebar to see how you can get the cutting mat free!!! So, have you ever just felt incredibly blessed by this hobby papercrafting fun addiction of ours? Well Tuesday was one of those blessings days for me - let me tell you about it! especially this time of year, when the lines are out the door, and down the steps! I need to be doing! So....by the time I actually get my mail, I'm working on a tiny bit of grumpy. Well........Tuesday was so NOT a grumpy mailbox day! Let me show you what was in there! First, a padded envelope. Nope - not showing you that....lol. sweet feller even has googly eyes! Be still my heart! The note on the back of the tag was so very sweet. I actually teared up. creative mind - I'm inspired each time I go. Thanks for letting me share my happy mail with you! Today is a Repeat Impressions' Designer's Choice Challenge, at The House that Stamps Built. Melissa Cash is our talented challenge hostess. 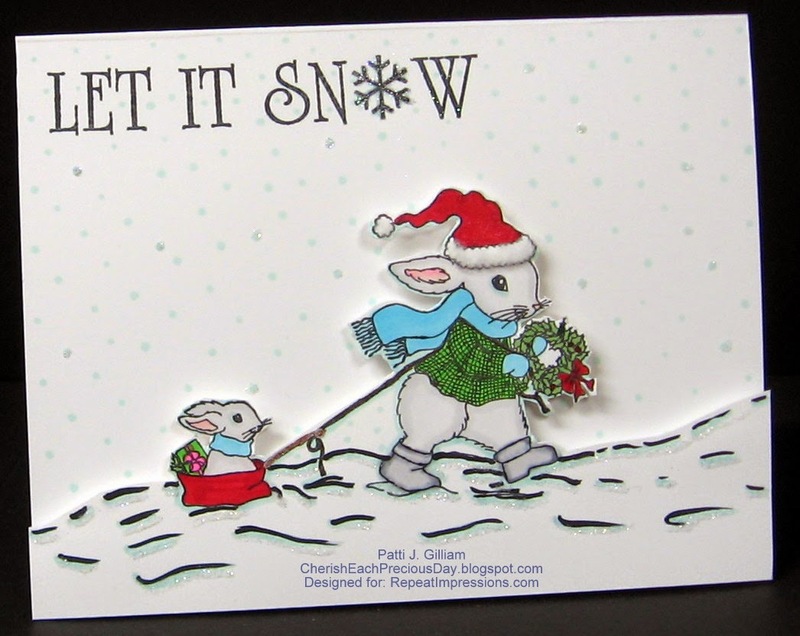 Melissa chose the theme 'Think Snow' for her DCC challenge. 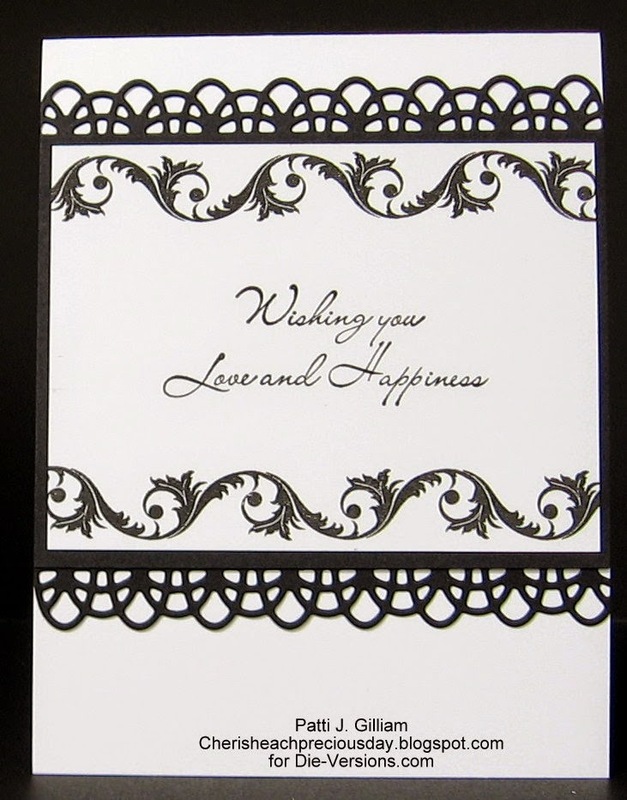 To create this card, I made my white A2 card base, and stamped the sentiment. I then took a Copic BG10 marker and made snow dots everywhere! The little snowflake in the sentiment was highlighted with the marker as well. 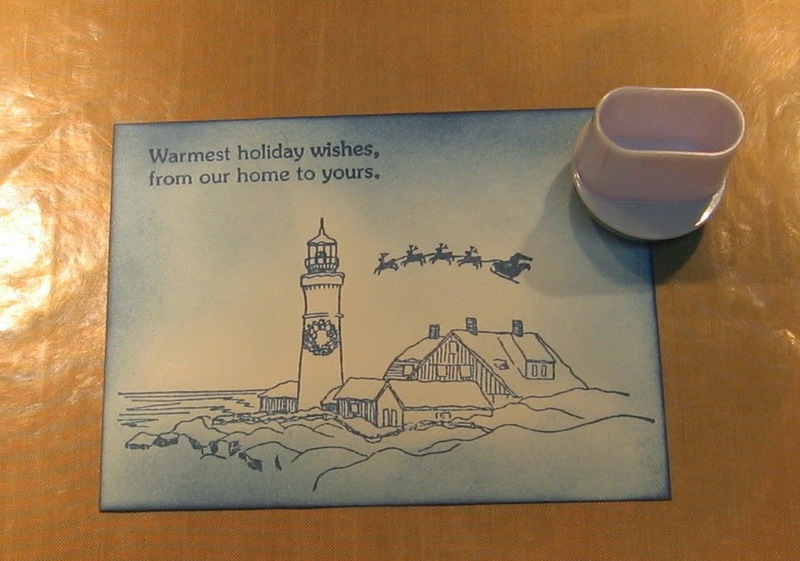 The incredibly fun image was stamped on another piece of white cardstock. I took a black marker, and brought all of the snowdrift 'lines' all the way out to the edges of the cardstock, colored the image, and yep, more dots! 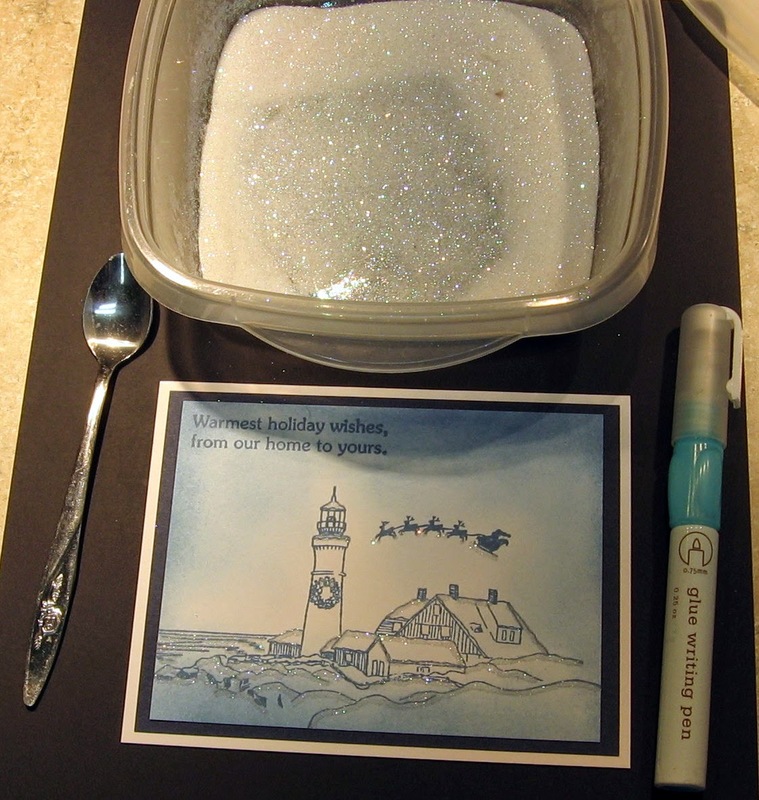 Then, some glitter was added to the snowflake, some of the dots, and the snowdrift lines. Fun flock was added to the hat for some additional dimension. 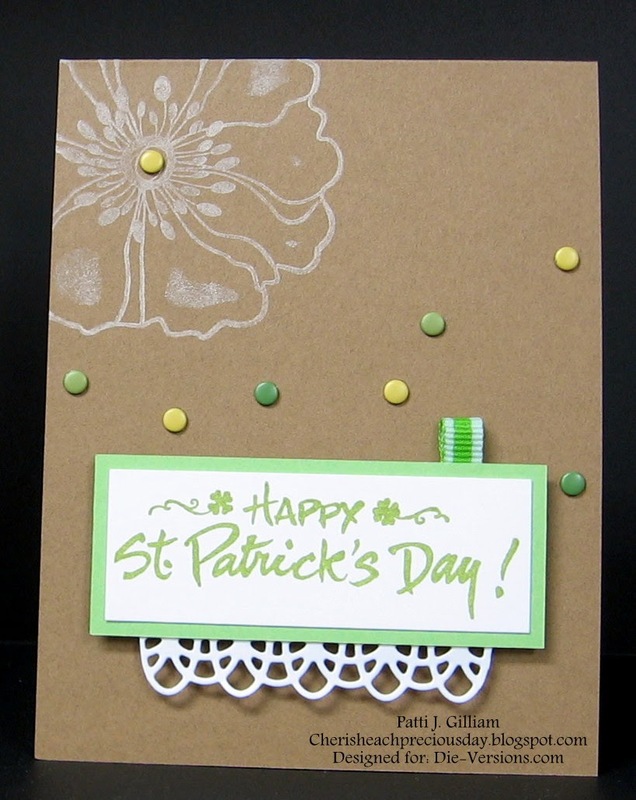 After it was finished, I fussy cut around it all, and popped it up on the card base. Oh, what fun this was to create! Someone VERY special will be getting this in the mail! 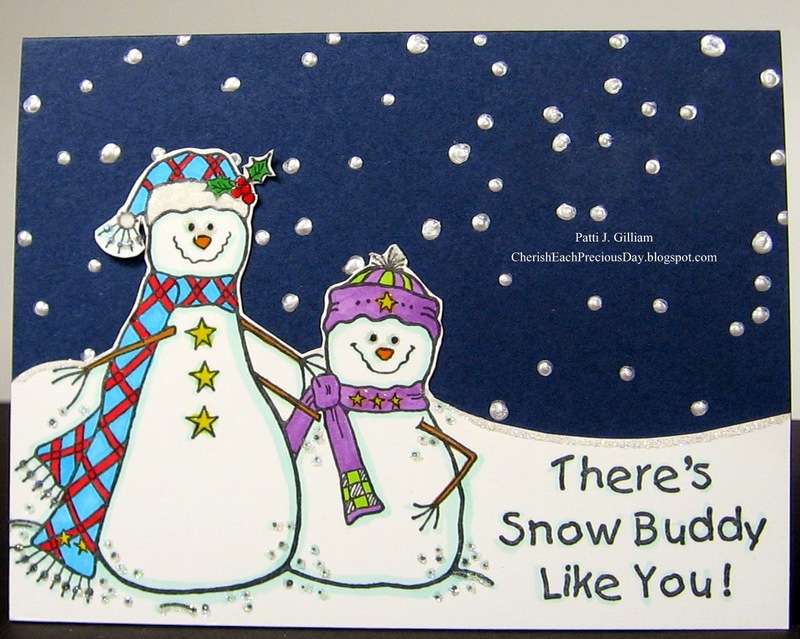 Now, it's time to see what my fellow Rock Stars have been up to, while they've been thinking 'snow'! While you are checking out their blogs, stop by The House that Stamps Built, and sign up to follow! We have some fun new things in store for 2015 - you won't want to miss a thing! You can always save money on your purchases at Repeat Impressions - check out my sidebar for details!!! 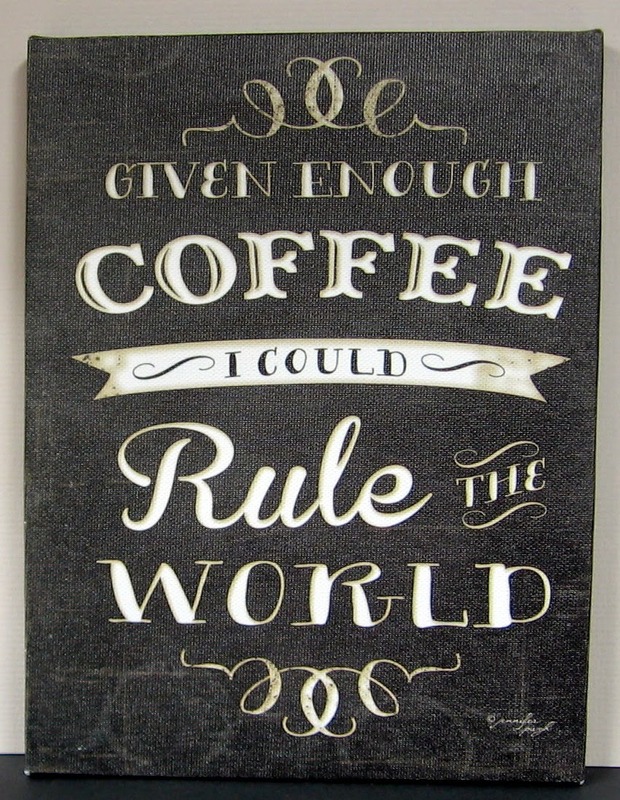 The Coffee Lovers Blog Hop was so much fu, don't you think? There were nearly 300 entries! I'm not the only one that loves my coffee...tee hee! Okay, drum roll please.........it's time for a winner! Congratulations, Judy! please email me with your mailing information so I can get this out to you. Thanks for your comment! I'm here today with a project for the Die-Versions blog. Since it's the holiday season, and we are missing our family, this die called out to me. 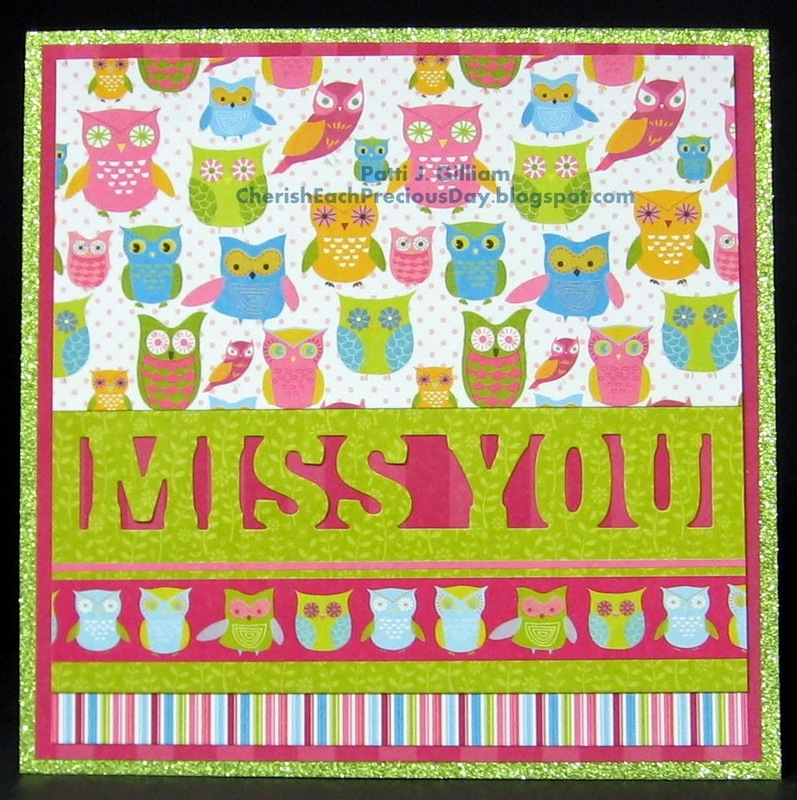 and look at how much fun you can have with the die, along with mixing and matching patterned papers on a 6 x 6 card! While you are out and about, be sure to sign up to follow the Die-Versions blog. 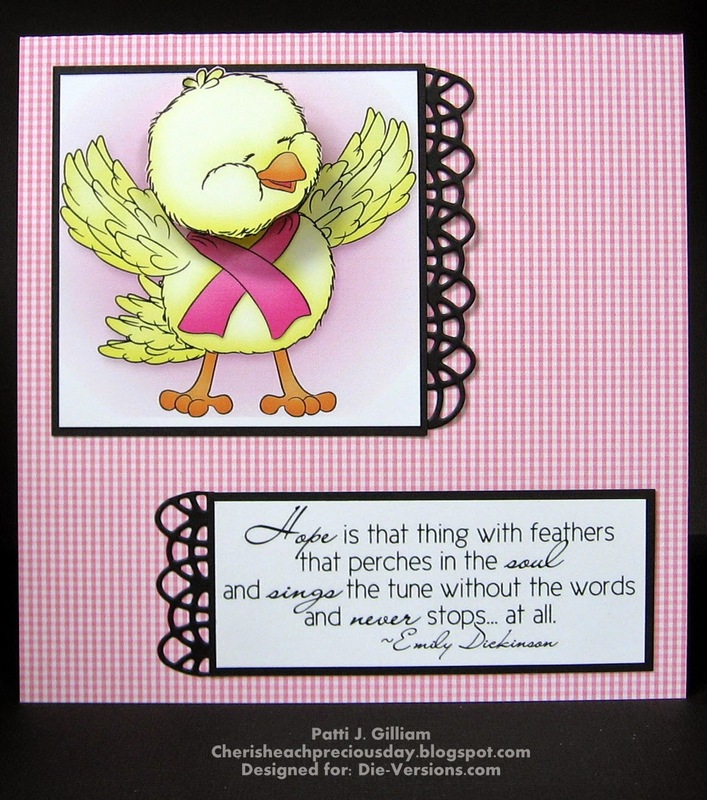 Each day, one of the DT members posts an inspirational project to help inspire you to use your dies! I'm here today with a bit of fun! A few weeks ago, seven of us decided we would do a Christmas/Winter card swap. 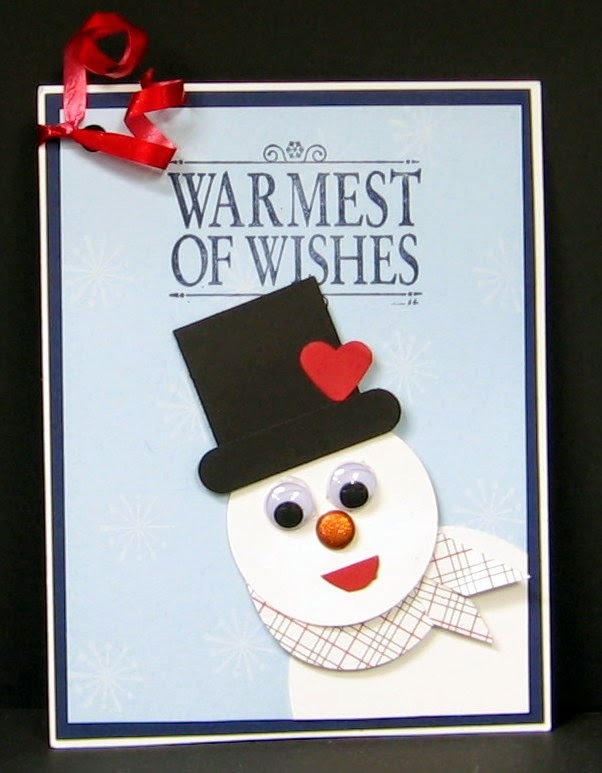 further, and do a blog hop with our swap cards! Once my mailbox began filling with swap cards, I panicked! I actually used this card for two swaps. 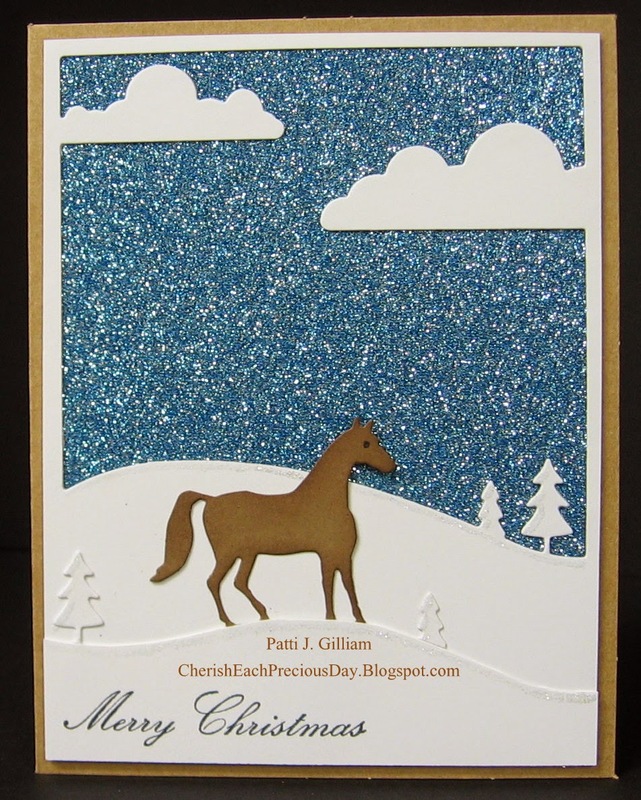 The first attempt was the card with the larger flakes. 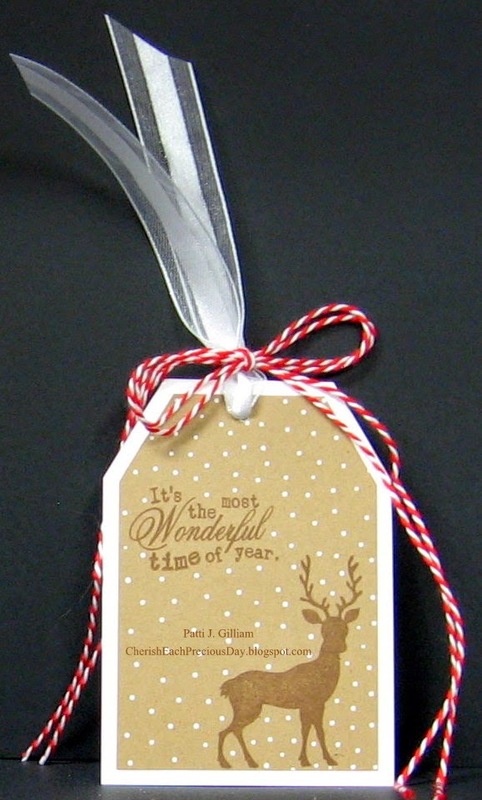 I simply could NOT get the ink to dry, so I added some Liquid Pearls to the top of the stamped snowflakes. Since I was still feeling a bit inadequate (lol...) I tucked a little tag into each envelope. Anyway, we had a great time! 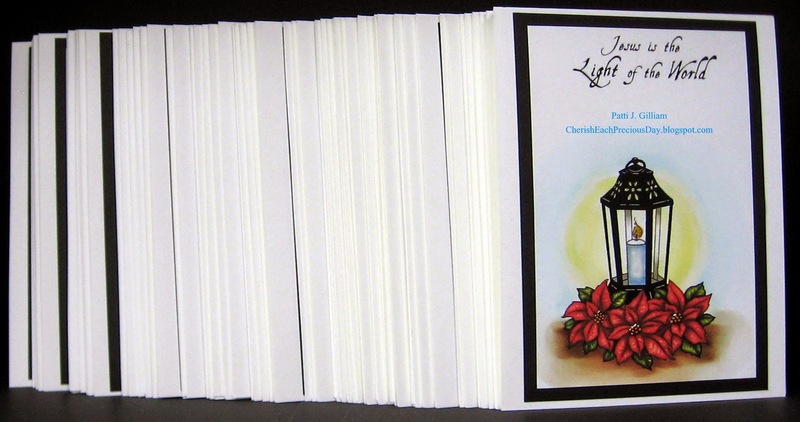 Hope you will swap cards with us sometime! Now, you can hop along with us, to see what the other uber-talented folks created! 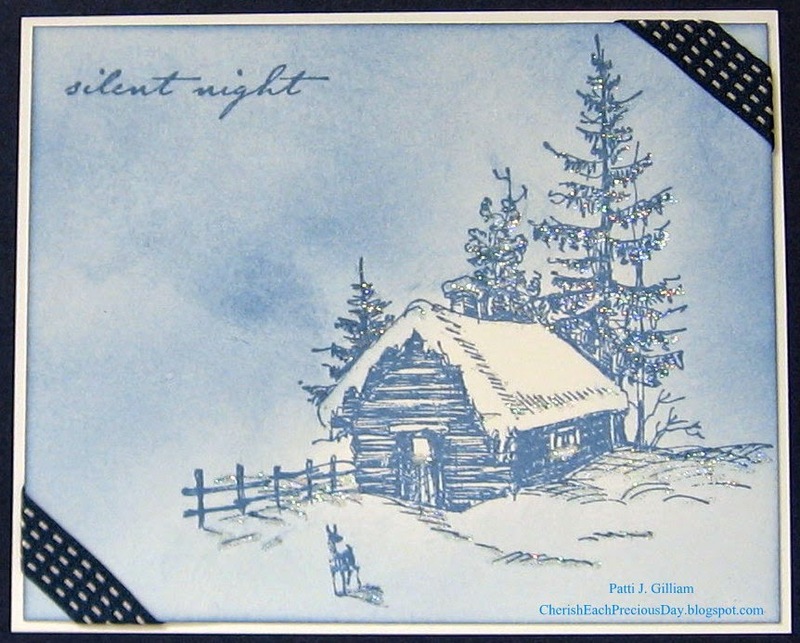 Scroll down or click HERE to see my card for Repeat Impressions', The House That Stamps Built. 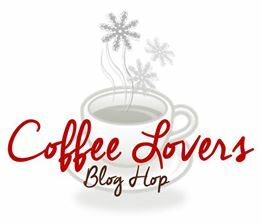 I am participating in the Coffee Lovers blog hop hosted by the uber-talented Amy Tsuruta! You will want to check out all the details on Amy's blog. Lots of fun prizes from 27 Super Sponsors. 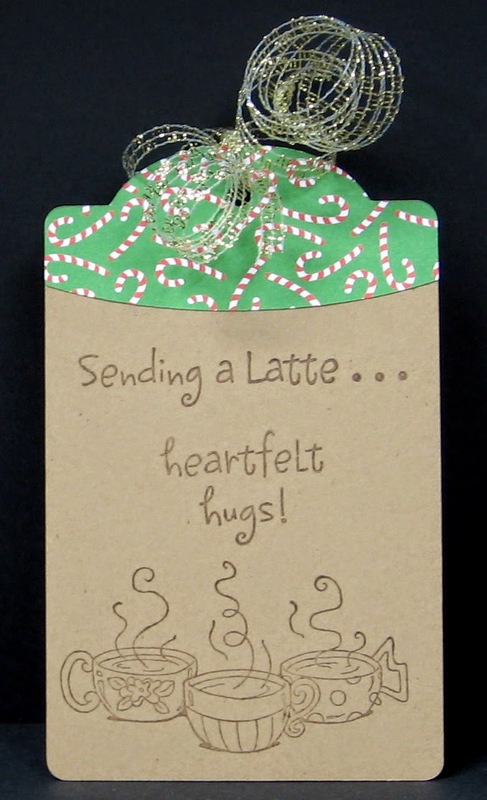 The gift bag, for my Coffee Lovers Project! 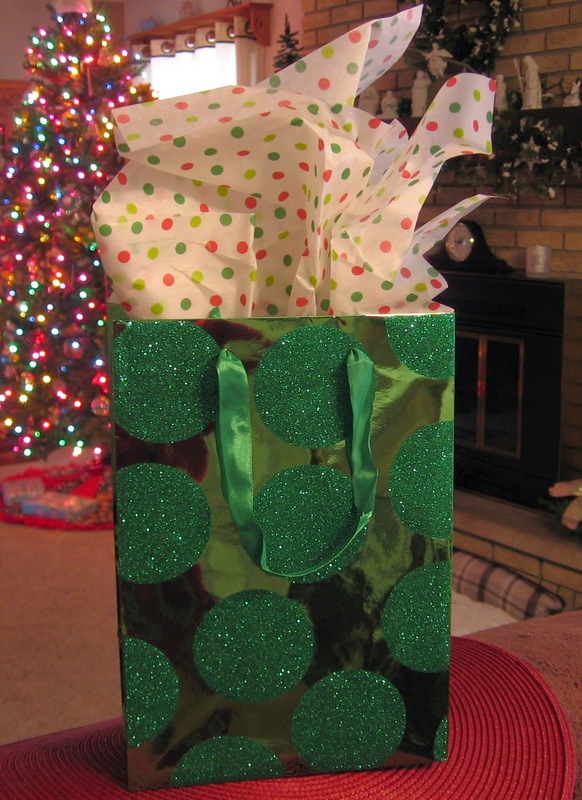 what exactly is IN this gift bag? 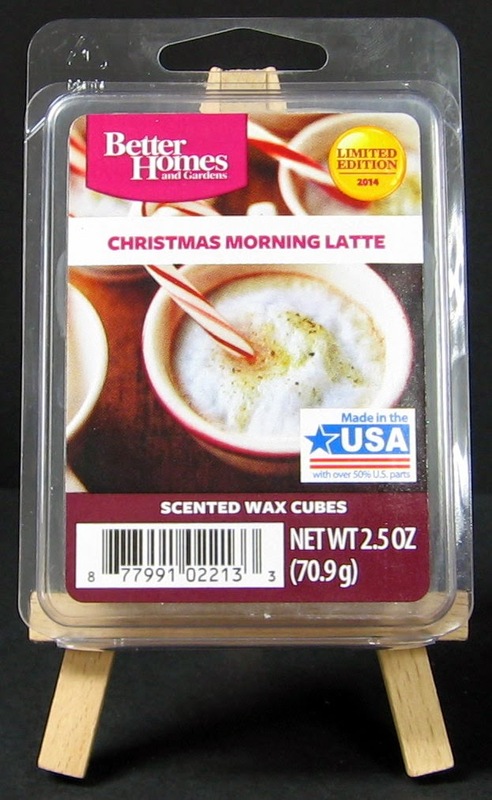 Christmas Morning Latte Scented Wax cubes.....of course! Yum! 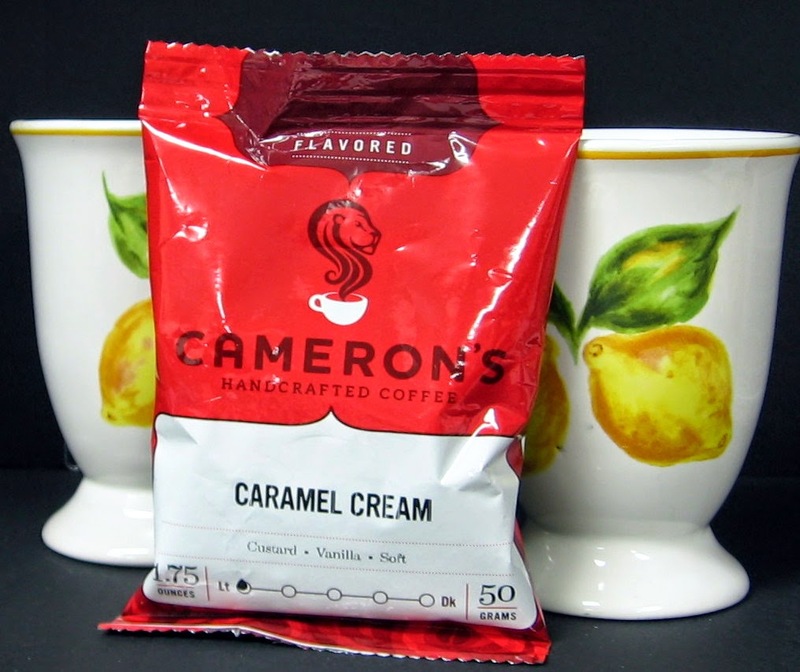 And...last, but not least, COFFEE (Caramel Cream Coffee!!!) and two coffee mugs! This hop has been a lot of fun to do. I can't wait until this evening when I can sit down and hop from blog to blog, to see everyone's wonderful creations! Click here to visit Amy's blog. You will find the link-up there, to visit all of the hop participants, and check out the great prizes! Speaking of prizes......one lucky person to leave a comment on this blog post will receive today's project! When you comment, please be sure to leave me a way to contact you - email would be great! 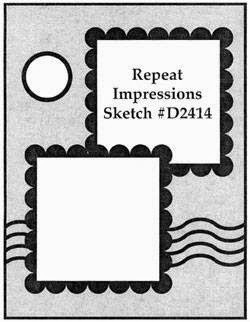 Stamps: Great Impressions #F537S and Great Impressions E777S (also used some old TAC sentiments on tag. Accessories: Gold curly ribbon from my stash, Gift Bag, Gifts, Copic Markers, Perfect Papercrafting Perfect Layers Mini Rulers and Cutting Mat (check out sidebar to see how you can get the cutting mat free!). 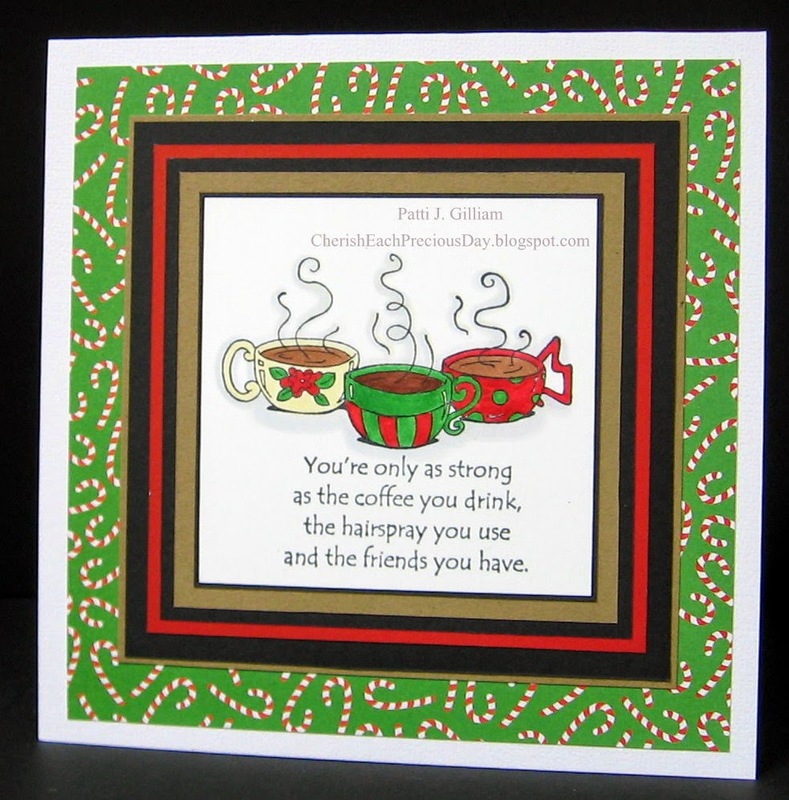 I am entering the card and tag in the challenge at Great Impressions - just use a Great Impressions Stamp! Now, being the rebel that I am, I flipped the sketch up on its end! 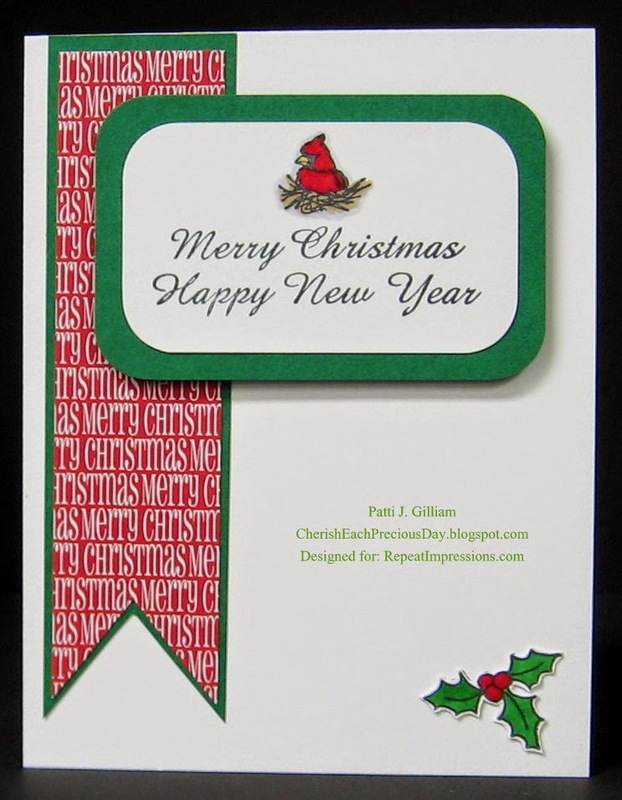 Repeat Impressions 307-D Holly Sprig, Repeat Impressions 2105-I Merry...Happy..., White cardstock, green cardstock, Perfect Papercrafting Perfect Layers Mini Rulers, Memento Tuxedo Black Ink, Copic Markers, The Paper Studio Christmas Basics DP, Hobby Lobby Corner Rounder Punch. I hope that you will check out my fellow Rock Stars' blogs, to see what they have made with this great sketch! Happy hopping! Check out my sidebar to find out how you can save money on your Repeat Impressions Order! 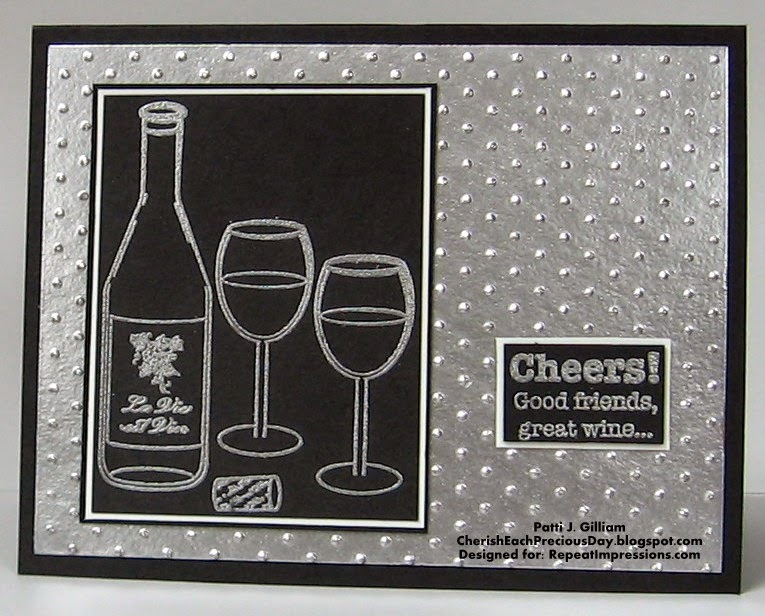 You can also get a free cutting mat from Perfect Papercrafting - check out my sidebar! I've been MIA - seems the last week and this next week are filling up so quickly. still working on. Will share those too, when finished. 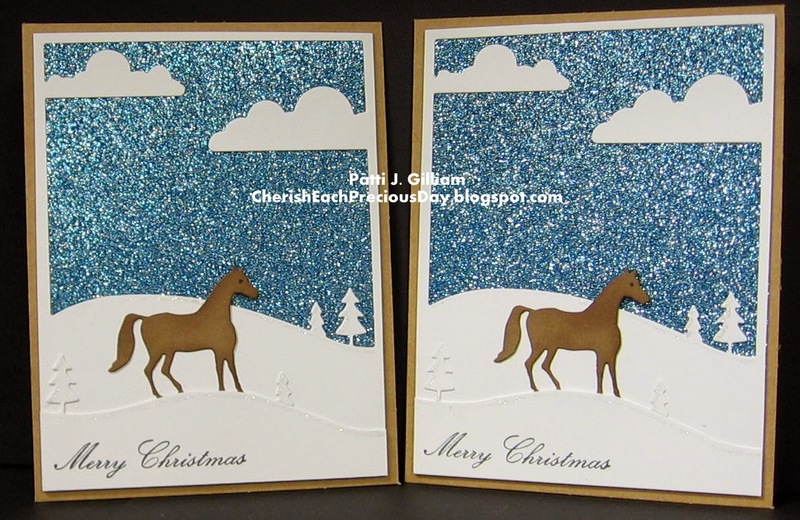 I went to Pam Sparks' blog one day, and saw THESE cards, and decided I simply HAD to follow her link, and shop HERE, at StarLit Studio, for the Memory Box Horse Country Die. I had never shopped at this site before, but I will be back very soon to shop some more. The prices are very reasonable, and the item was here in my hand so quickly that I was amazed! I think you'll like it too, so check it out! I don't often completely 'case' a card, but I'm thinking this is pretty close to a total case job! Pam's card was perfect for what I needed. A young pre-teen girl we know has taken up equestrian training, and is doing such a wonderful job. She has two instructors, so I made these cards for K to give her teachers for Christmas. Hope they like them! 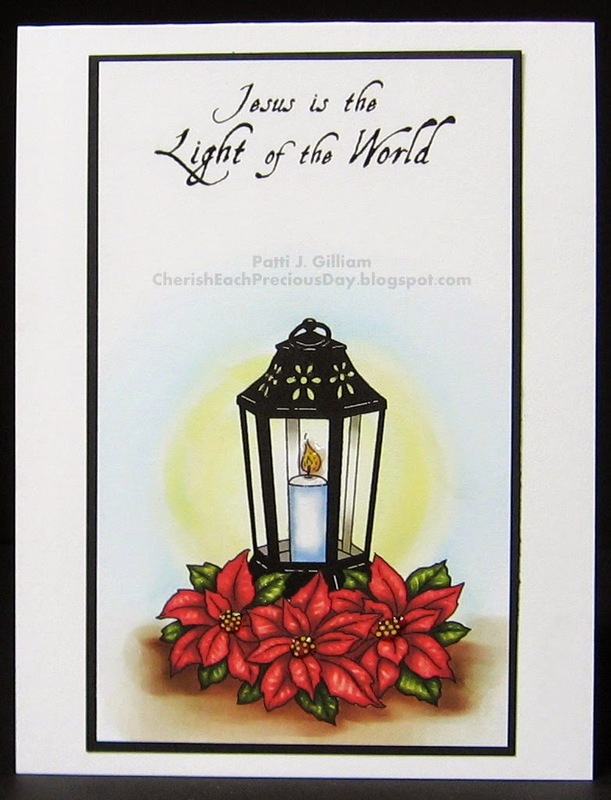 The cards I created for our congregation began with a digi image set from Fred, She Said Designs. That panel was attached to an A2 card. Then...out came my clear Wink of Stella Glitter Pen. All of the leaves and flowers had a touch of glitter on them, as well as the little lantern designs, and the entire candle was 'glittered'. These are the finished products. 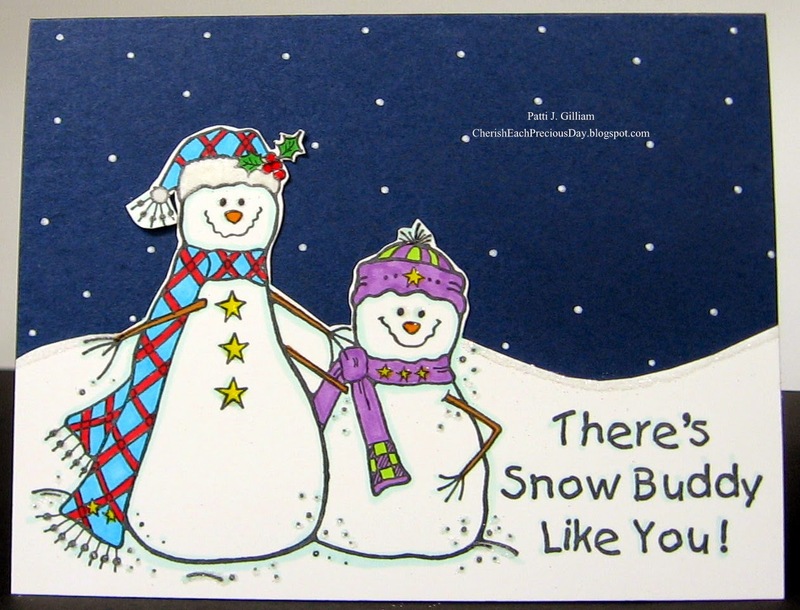 The border on all of these were wider than the 1/8" border that I worked up on the first card (see photo below). I love the way the black 'pops' against the white card base. That is all I have to share today! It's been a productive day. We had church, then Sunday School, followed by an hour of ringing the bell for the Salvation Army with another couple from church. 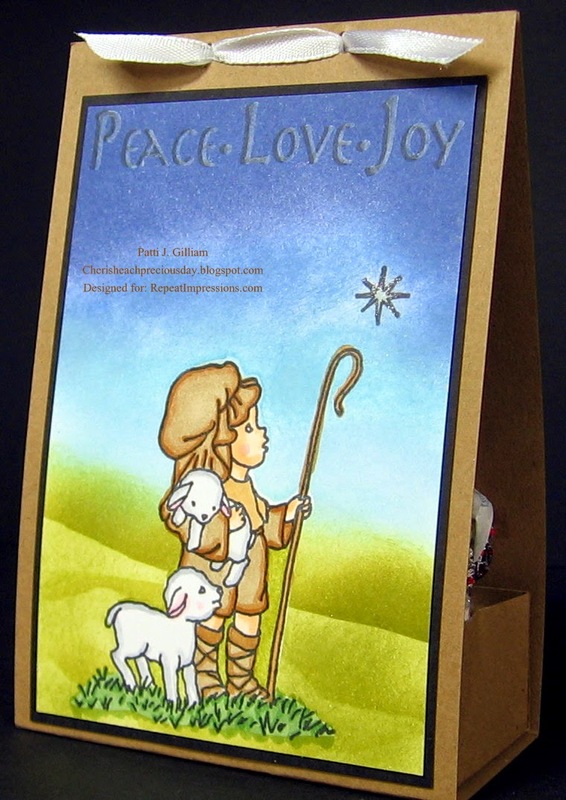 At 4 p.m., we will shop for a needy family, with the Sunday School 'dues' we've collected in our class, each Sunday this year. We will all go out and eat way too much after that. Tomorrow is one of those days, as well! Gotta love this time of the year. Does my heart good to see so many people doing good deeds for those less fortunate. Hope you've had a good day, as well! Hi there, and Happy Wednesday! It's time for a new Designer's Choice Challenge at The House That Stamps Built. us all to create 'Anything but a card'. Be sure to check out my sidebar to find out how to save money on your Repeat Impressions orders! I began by stamping the image onto a piece of white cardstock. I stamped the image again onto a post it note, fussy cut it, and placed it over the image, creating a mask. Then I began sponging the sky. Working from the top down, I used three shades of distress ink. I tore a couple of post it notes to make the 'hills', and sponged them with two shades of green distress inks. I then removed the masks, and colored the Shepherd Boy with Copic markers. The star was dotted with glitter. 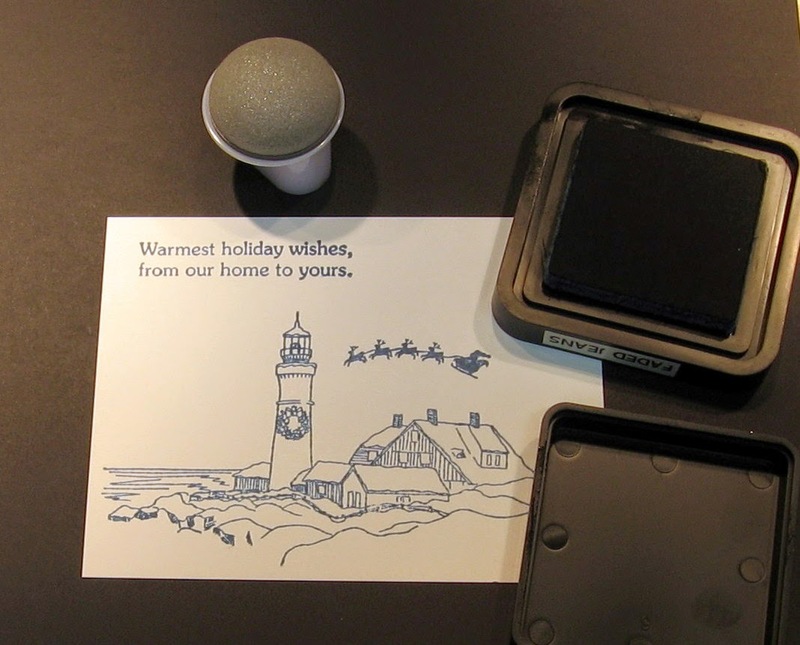 The sentiment was stamped first with black ink, and then again (moving the stamp slightly) with Alabaster chalk ink. Matted the image with black cardstock using my Perfect Layers Mini Rulers (check out the sidebar for details on saving TEN percent! Here's the box all opened up, and filled with chocolate deliciousness! 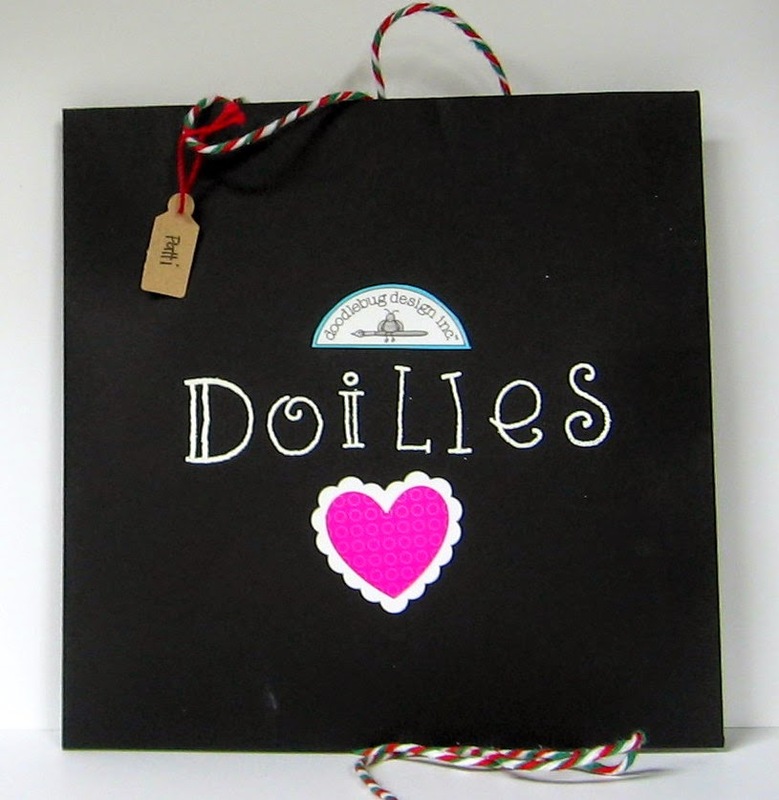 This darling little gift box was featured at My Chic n Scratch last week. Now, it's time to see what my fellow Rock Stars have created with this fun challenge! 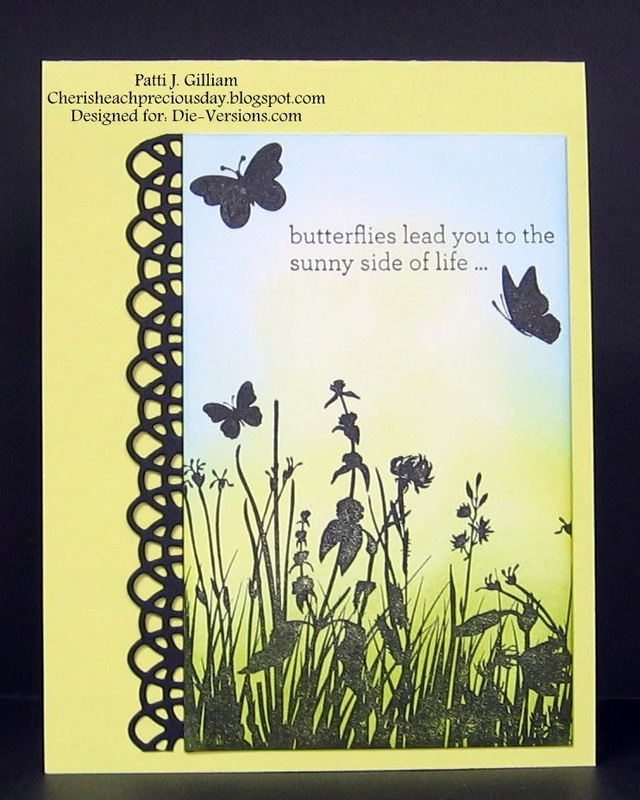 Be sure to check out Repeat Impressions for the beautiful stamps that we used today! Let me know if you make this box - would love to see it! Can you believe it's the last Friday in November? Seems this year has just flown by. I decided to look for some more fun words to work with. 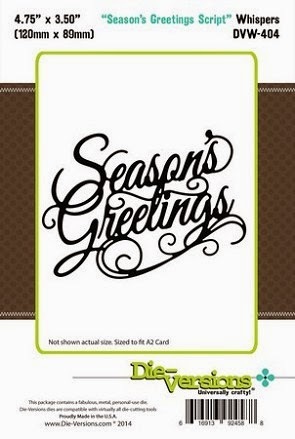 and Die-Versions Whispers "Seasons Greetings Script" DVW-404. 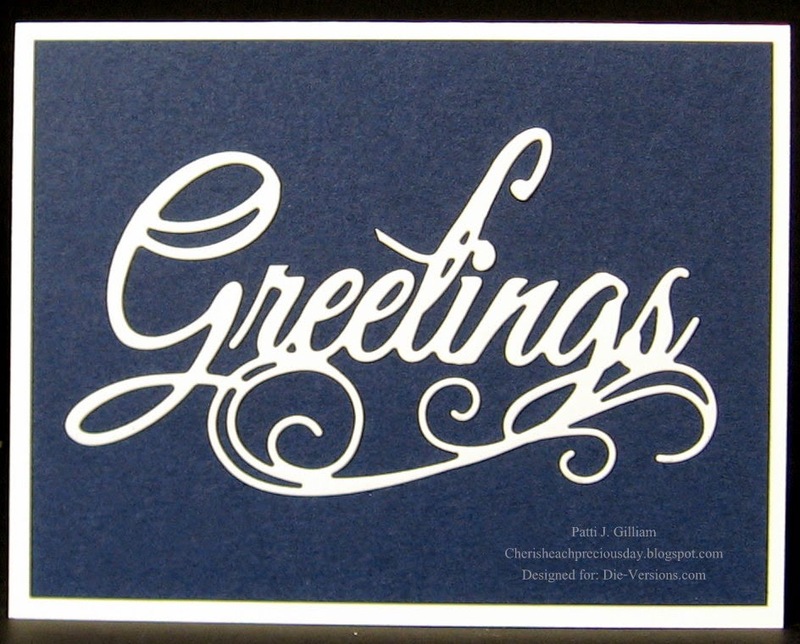 For this card, the word 'greetings' was carefully trimmed away from the word 'seasons'. When adhered to the card front, I placed it straight on the card, rather than at an angle. Now I have a card that can be used for any occasion! These next two projects were so much fun! Michael's had these little frames in their $1.50 bin. I purchased three of them! Here are two, that are all ready for the holidays. several sections of 4' ceiling lights. 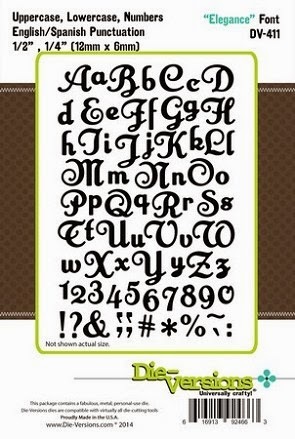 I hope you've enjoyed seeing the fun that words and fonts can be! love for you to shop at Die-Versions! A little Christmas 'to me, from me', right? Here is hoping that your day is filled with the blessings of family, friends, love and laughter. Hope it also holds a bit of turkey, stuffing, potatoes and gravy, and so much more. And...pumpkin pie would be a great way to end your wonderful day! It's nearly Thanksgiving, and I hope that you are all going to be able to enjoy some special family time. We are having friends in, as none of our kids can make it in for the holiday. We are looking forward to a nice day. 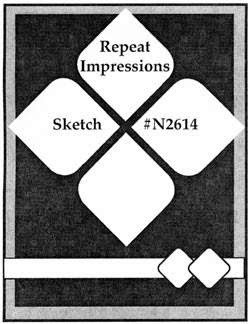 It's time for another Repeat Impressions Sketch Challenge at The House that Stamps Built! 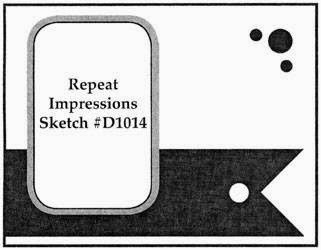 There is an entire page of 'Quartet' stamps at Repeat Impressions! 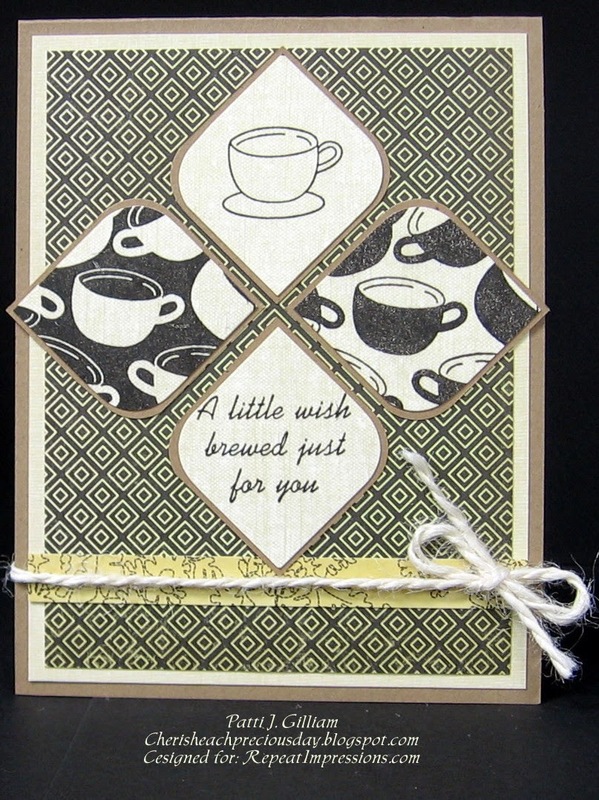 For this card, I used '8512-U Brewed Quartet'. The stamp actually comes as a square, with all four pieces in sort of a grid. corners to achieve this pattern. to come live with you!!! I hope you'll check out my fellow Rock Stars' blogs, to see what they did with this fun sketch! I used my Perfect Layers Mini Rulers for the nice even matting - check out my sidebar to see how you can get a free cutting mat! Monochromatic cards inspire me SO much, but scare me even more! I have a really hard time getting myself psyched up to create one! It's funny what intimidates us, right? this just had to be my technique! I apologize for the photos. I have some bright halogen lights above my work area, and I simply could not get any shots that were without glare. 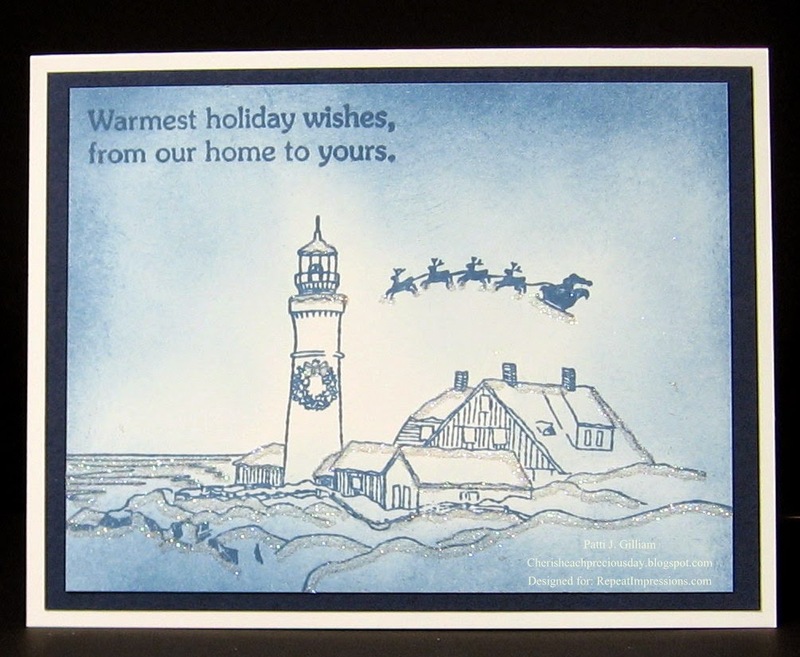 For this card, I used two beautiful Repeat Impression Stamps, '2101-Q Santa over Portland Head Light', and '2208-G Warmest Holiday. 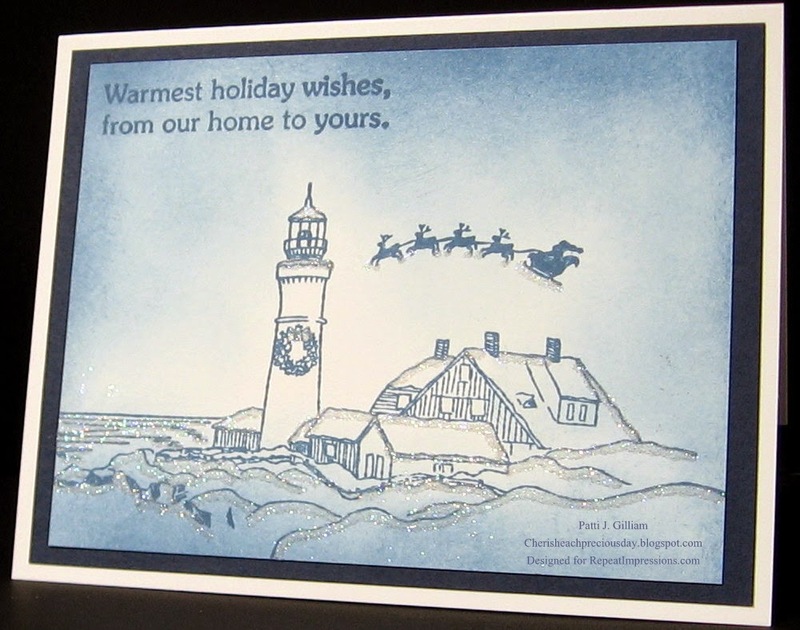 The Portland Head image is also available without the Santa. Repeat Impressions has a whole page of Lighthouse images that are gorgeous...be sure to check them out! 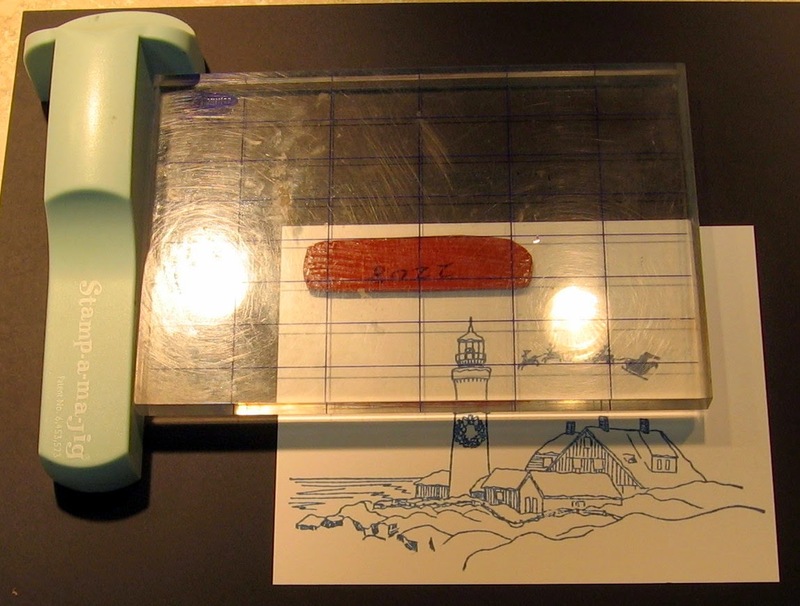 so the first step was to stamp the image. in gold. 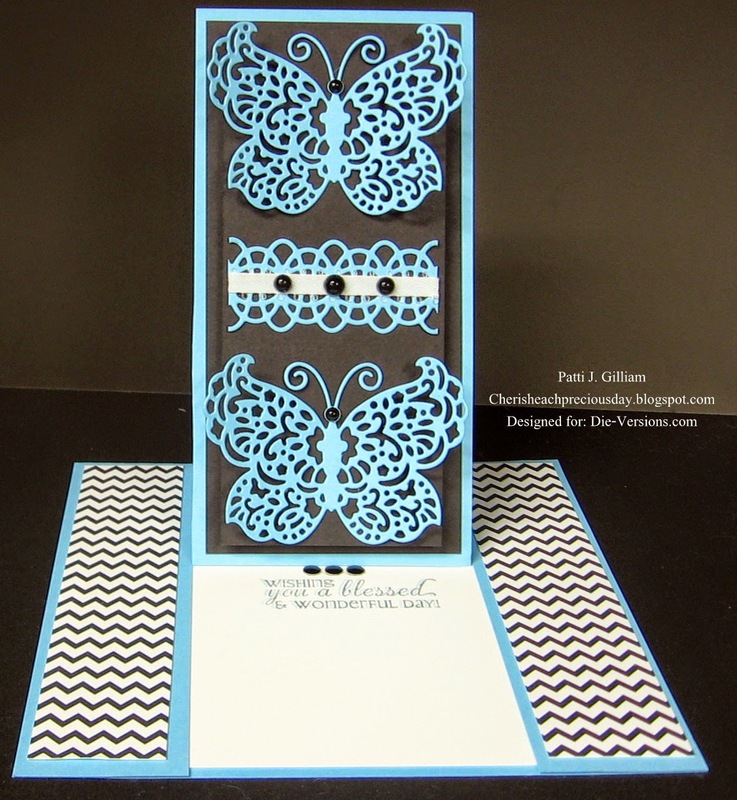 There is no guess work - the stamping goes exactly where you want it. off of the cardstock, working in. I left a bit of light area, hoping to achieve the look of a pretty sky. ran out!!! ), and added a bit of 'snow and ice' to the image. One more view - hope you can see the sparkle! Hope you'll do a bit of browsing and shopping at Repeat Impressions today! Check out my sidebar for a link to save on your order! I used my Perfect Papercrafting Rulers and cutting mat to get the pretty black mat. Check out my sidebar for details on getting a free mat!